George Town was designated a UNESCO World Heritage Site on July 7th 2008. This year, to celebrate the 8th anniversary, the George Town Heritage Celebrations will be the most elaborate and extensive yet. The annual celebrations are organised each year by George Town World Heritage Incorporated (GTWHI), an organisation which was established by the Penang State Government in April 2010 to manage, monitor and promote the George Town UNESCO World Heritage Site. This year, the celebrations are themed ‘Mai Main’, which means “Let’s Play” in colloquial Malay, and are designed to showcase another aspect of Penang’s “non-tangible heritage”, the traditional sports and games of the different communities that make up George Town’s population. Some of these recreational, religious and ritual activities are being offered as workshops for visitors to learn skills; others are being showcased in street performances within the old city. 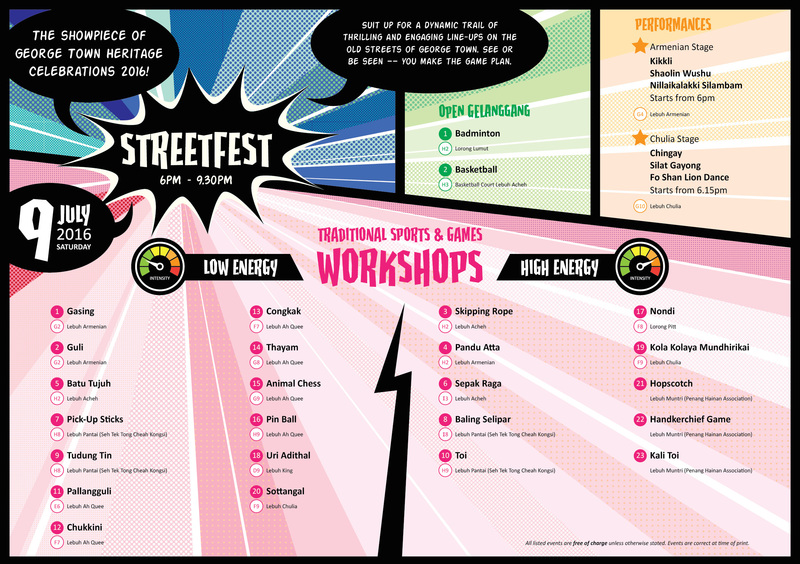 Introductory classes and forums take place over a three-day period, but it is on Saturday 9th, during the “StreetFest” between 6pm and 9.30pm, that the streets of George Town will come alive with performances and demonstrations. Stages will be set up in Armenian Street and Chulia Street with performances beginning at 6pm of lion dancing, shaolin king fu, chingay, Nillaikalakki Silambam (an Indian martial art) and more. 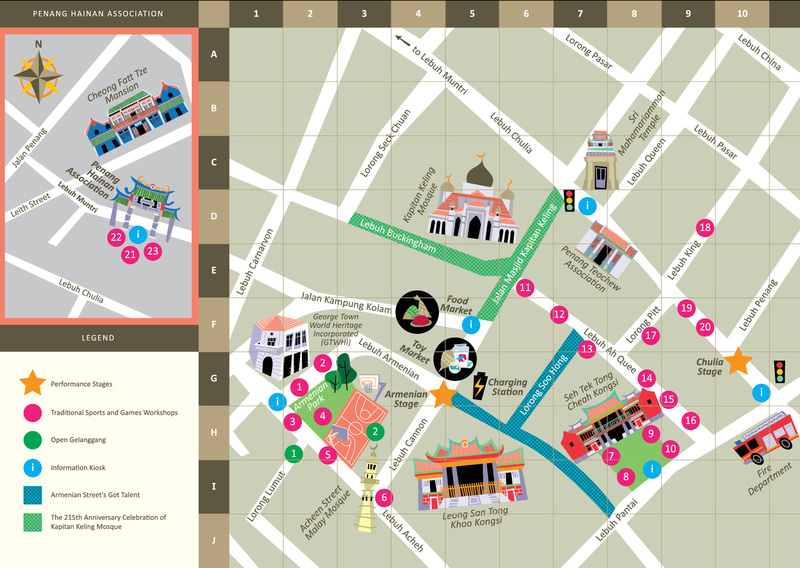 Workshops on more than twenty games and sports will be held, primarily around the newly renovated Armenian Street park, the newly renovated Cheah Kong Si, and the Hainan Association on Muntri Street. Exact locations are shown on the map below. People can watch or participate, and the activities have been usefully divided into “low energy” and “high energy” . A Chinese strategy board game featuring various animals. Every animal has its own hierarchy and direction of movement, akin to the Western chess, and the goal is to capture the opponent’s house by moving the animals to the opposing side or to eliminate the opponents’ animals. However, player is constrained to a one-square movement – forward or backward – compared to the multiple-squares’ movement of a typical chess. A strategic physical game of which a team of players will build a pyramid with 3 slippers and the opposing team will attempt to strike it down with a “killer” slipper. Once the pyramid is destroyed, the builder team will try to rebuild the pyramid while the opponents will attempt to take out the builders using the circulated “killer” slipper. The builder team wins if they manage to rebuild the pyramid. The opponent team wins if they manage to “kill” all members of the builder team. A graceful game that is popular among girls and women of all cultures. Using the coordinated movement of hand and eyes, players will toss and catch a handful of stones through varied techniques. Congkak is a folk game of the Malay community that uses an elongated, boat-shaped vessel as the main component of the game. Another variation of the game is called Pallangguli which uses a rectangle vessel as the main device. Players will strategize to capture as many seeds as they can in each round, and to ensure those seeds are transported to their ‘storehouses’ to win the game. Both congkak and pallangguli are mostly played by women. Gasing is a popular folk game and people of all ages and cultures play it. Equipped with a rotary gear (usually made of wood), players will attempt to keep it spinning for as long as possible. Before the start of a game, player will tie cotton string around the rotary gear to facilitate its release. The losing party will then had his or her gasing to be attacked by the other players once, and then a new round starts. A type of game commonly played by boys and girls of all cultures – with marbles as the arrows and the fingers as the bow. Each player will take turn to flick a marble to a pool of grouped marbles, aiming to get as many marbles as possible out from the designated area. These marbles become their tokens at the end of each game. A physically involved game of hopping on sequenced squares drawn on the floor. Player will hop on the squares using one or two legs based on the sequence. At the beginning of each round, a stone will be discarded to one of the numbered squares that correspond with the sequence of the round. A round is complete when a player hops over all the squares and retrieve the discarded stone. A strategic physical game of running where a team of players will have to cross a series of positioned opponents along a designated grid on the floor. The exponent team succeeds if one of the team players manages to escape being touched or captured by the opponents and returns to the home ground. A tune-based game which involves a selected ‘Fox’ who will be dropping a towel behind a circle of unsuspected players. Throughout the course of the game, a folk song will be sung – until the Fox drops the towel to the selected target. If the target fails to catch the Fox – he or she becomes the next Fox – and the cycle continues. A delicate game involving a bunch of colourful plastic sticks that will be dispersed by a player, who will release them from his or her grip. Other players are then required to skilfully remove each stick from the stack without moving the other sticks. Players are only allowed to use their bare finger, or from a stick he or she picked, to aid in the removal. A traditional game that is common among the Malay community. Usually played by males within the compound of a court and with a rattan-weaved game ball. It involves a skilful coordination of various body parts to deflect the ball from player to player. A strategic game-of-chance with Hindu origin, it revolves around the use of a pair of dice and seeds. Players will toss the dice to determine the steps to be taken on the board and once a player reaches the final destination, the game is concluded. Along the way, player will have the chance to eliminate the seeds of other players as well. While Thayam and Chukkini are of the same mechanics, the shape of the dice and the rules of each is different from one another. A type of game commonly played by boys of all cultures – with bottle caps as the arrow and the fingers as the bow. It engages the concentration and accuracy of the player to strike the target as assigned by the opposing player, occasionally with obstacles in between. A popular game played by boys and girls of all cultures. There are several ways of playing that involve players crossing a rubber band-made rope. Usually two players will hold each end of the rope, and the other players will take turn to skip over it. A strategic physical game of hit-and-run usually played by boys from the Telugu community. A ball or fruit will be tossed around to hit players from the opposing team. The team which manages to hit all members from the opposing team wins. Uri Adithal is a popular activity in various regions of Tamil Nadu. A person will be blindfolded and asked to smash the pot with a long stick. The pot, which is held high, is usually filled with flower, turmeric water or various grains. By altering its height through the effort of a group of people, the entertainment value of the game will be enhanced. Crowds at the side will make distracting instructions to confuse the player in order to add to the fun. It is usually played during Pongal Festival. An ancient physical art of training, Silambam is named according to its primary weapon—the bamboo stick. The specific variation is derived from nillai meaning posture and kalakki which means to disturb or shuffle. The moves of Silambam essentially revolve around integration of rhythmic stick twirling and agile sequence of leg movements. Silambam can also be practiced with bare hands. Seni Kapi is a modern style of the ancient art which originated from Penang. The name of its primary weapon, the Kapi, is derived from the word “Kayu” (wood in Malay language) and “Tekpi”, a short-handled trident. The system utilizes manoeuvring of the Kapi stick which is ideal for short-distance combat and self-defence. Tai Chi is an abbreviation of tàijí quán 太極拳. It is derived from the Chinese term tàijí – meaning the source or the beginning, and quán which means fist or boxing. Tai Chi typically consists of sequences of slow-controlled movements, although there are also secondary forms with faster pace. There are also variations of the art which involve weapons. Tai Chi is categorized as a neijia ‘soft’ style, i.e. martial arts applied with internal power, the Qi. The word yoga means “union”: of the body, mind and spirit. It is an ancient system originated from India involving breath control, simple meditation, and the adoption of specific bodily postures. There are many branches in yoga; each with different practices and goals. Today, yoga is practiced worldwide as a system of physical exercise. For more information and further updates on the celebrations, check the website at http://heritagecelebrations.info/ , contact Koe Gaik Cheng at +604-261 6606 or email projectmanager.hc@gtwhi.com.my.